This document appears on page 242a in the Women's Institute scrapbook - the local identifier number for this particular scrapbook is 5sb. Original photographs included in this Women's Institute scrapbook have had individual records created for them, greatly increasing their accessibility for searching under general keyword terms. See the link - Tweedsmuir History, Castleton Branch, Women's Institute - on the right side of the page to access the scrapbook. Click on the Select arrow for Pages to see the relevant page. The Pages box is located at the top of the page. 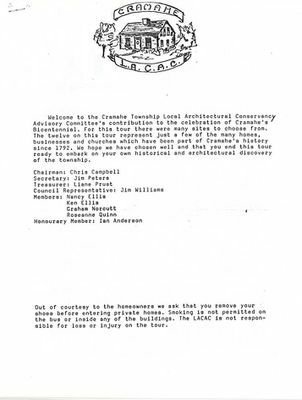 Multi-page document about the Cramahe Bicentennial House Tour, 1992, L.A.C.A.C. with sketches. Includes Oriental Hotel, Loyalist Inn, Keelers Tavern, and Keeler House.